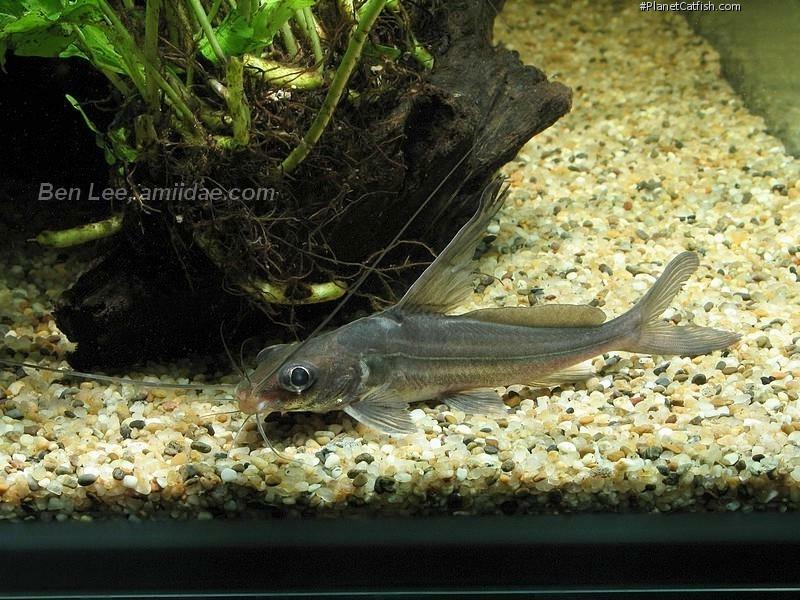 As an occasional import, found for sale perhaps only every few years, all catfish fans must surely rate the King Bagrid as one of the fishes they'd love to see or perhaps even keep. Although the fish is not broadly unattractive, its gun metal colouration doesn't win many over on colouration alone. It's because of the fish's appearance that this is so and specifically because of the unfeasibly high dorsal fin this species has. For centuries, we've artificially created fishes with long fins, that's nothing new, but in today's pressured commercial world, it's nice to find one that nature created many millennia ago. The Asian Lancers are so called because of these distinctive fins. Common names pay little respect to scientific classification and we find at least two genera that can be sold as "Lancers". In fact, it is only recently that the King Bagrid has been considered as a member of the genus Mystus, many of you will be more familiar with its previous placement in Heterobagrus. The name lancer obviously relates to the tall dorsal spine that I've always fancied originated from the impression of the cavalry lancers of the British Empire's colonial past mounted on a horse with the lance pointed vertically. Maybe I'm over thinking it; but the dorsal fin is a potent lance in this fish and of that there can be no doubt. For some odd reason, many of the speciality species of Asian bagrid don't appear to command a high price. This is doubly odd as their infrequent availability (at least to aquarists in the west) would make you think that, when they are available, the price might be more than it usually is. Pricing on King bagrids can be wildly variable. Last year I saw this fish available at an adult size (say 4-5") at £40, smaller fish (around 2") at around £18. I've seen them much cheaper than that in the past, but, crucially, in over 20 years of looking, I've only seen them for sale three times. One also wonders that, like for example, the Asian upside down cat, Mystus leucophasis, or the Sun Cat, Horbagrus brachysoma, that they may be commercially farmed and become freely available at a few pounds after an initial stage of commanding higher prices. Albino individuals have turned up with some regularity (and they are expensive) and this would also suggest commercial farming too. Importers may be reticent to buy in these fishes at a higher price if they could get stuck with fish that will drop in price dramatically in the near future. Anyone who actually keeps this fish will not be in for much of a surprise. The fish is secretive; the trio I have grows quite slowly (maybe 1" per year) and likes the cover provided by bogwood roots. Indeed the long barbels of this species are perfect for probing out into the current beyond the safety of shelter to taste the water for anything edible floating by. I've kept these fish in a trio and my experience is that they are sociable, interspecies aggression can be a trouble with many bagrids and so it is with a little trepidation that I recommend trying a group of these fish. Certainly they are no trouble with other species and fit in well to a less than boisterous community set-up. Elegant and timid, these fish are however easy to keep in terms of water parameters and feeding requirements, just don't stick them in the hurly burly of a good sized cichlid tank and both aquarist and king bagrid will be happy for years. Type Locality Mé-Nam R. at Bangkok, Thailand. Distinguished from all other Mystus (indeed, from all other Asian Bagridae except Bagrichthys spp.) by its extraordinary high dorsal fin, involving great elongation of the non-serrate dorsal fin spine and first three or four soft rays. Distribution Asia: Chao Phraya and Mekong basins. References Versl. Akad. Amsterdam v. 16 355 Pl.